What Is a DA Form 3433? DA Form 3433 also known as the Application for Nonappropriated Fund Employment is a document used by military servicemen and women applying for NAF positions. This form can be attached to a resume or be used instead of one. It serves the same purpose as a resume: the form is used to evaluate how much the skills and experience of an applicant fit a certain position. The application - last revised in February 2016 - is often mistakenly referred to as the DD Form 3433. An up-to-date DA Form 3433 fillable version is available for download below. Used by the Department of Army (DA), this form is standard for applying for NAF positions. The DA 3433 is a form closely related to the DA 3433-1, and if used to apply, they should be submitted together for all positions. In some cases, you will also have to attach Form DA 3433-2. How To Get Da Form 3433? How To Complete Skills In Da Form 3433? Title 10, USC Section 3013; Public Law 101-647 Section 231; DoDI 1402.5; E.O. 9397 (SSN), as amended; and AR 215-3. To determine your eligibility and qualification for Nonappropriated Fund Employment. organizations in response to requests for names of employees and identifying information. however, if you do not provide your social security number, we cannot process your application. St. Bldg. 1465, Fort Belvoir, VA 22060.
announcement number on each continuation sheet. and in the job announcement. 11. IF CURRENTLY EMPLOYED, MAY WE CONTACT YOUR CURRENT SUPERVISOR? hardware, tools, machinery, typing speed, etc.). Job-related certificates and licenses (indicate expiration dates). 14. OTHER ACHIEVEMENTS - Job-related awards, honors, or publications. b. DO YOU CLAIM INVOLUNTARILY SEPARATED MILITARY PREFERENCE (ISMP)? c. ARE YOU A CURRENT OR FORMER DoD NONAPPROPRIATED FUND (NAF) EMPLOYEE? d. ARE YOU A VETERAN "PREFERENCE ELIGIBLE" AS DEFINED IN 5 USC 2108 (3)-(4)"? e. ARE YOU AN ENLISTED MILITARY SERVICE MEMBER APPLYING FOR OFF DUTY EMPLOYMENT? f. ARE YOU A U.S. CITIZEN? IF NOT WHAT IS YOUR COUNTRY OF CITIZENSHIP? g. ARE YOU ELIGIBLE FOR FAMILY MEMBER PREFERENCE? YOUR ELIGIBILITY FOR EMPLOYMENT IN THE HOST NATION. BEING TOLD THAT YOU WOULD BE FIRED OR LEFT ANY JOB BY MUTUAL AGREEMENT BECAUSE OF A SPECIFIED PROBLEM? If "Yes", give details, i.e. employer, address, approximate date, and reason for each case. c. MILITARY ON ACTIVE DUTY? APPROPRIATED OR NONAPPROPRIATED FUND SERVICE? HAVE YOU RECEIVED VOLUNTARY SEPARATION INCENTIVE PAY (VSIP)? a. HAVE YOU EVER BEEN ARRESTED FOR OR CHARGED WITH A CRIME INVOLVING A CHILD? b. HAVE YOU EVER BEEN ASKED TO RESIGN BECAUSE OF OR BEEN DECERTIFIED FOR A SEXUAL OFFENSE? If "Yes", provide a description of the case disposition. challenge the accuracy and completeness of any information contained in the report. sources of information, a separate specific release may be needed, and I may be contacted for such a release at a later date. Fill in your identifying information: your full name, address, social security number and date of birth. Enter your contact information: an e-mail, phone number, and a work phone if you are currently employed. Your personal phone will be the first way to contact you. List the position you are applying for. Choose if you claim spouse employment or ISM reference in Block 9. State your rank if you are active duty military. List your skills in Box 13: include all skills and abilities you think will be useful to qualify for the position you are applying to. Describe any previous job experience in Box 14, Working experience. Enter the names of any completed training classes you believe will help you qualify in Box 15, Training. Do the same with any received licensing or certification in Box 16. Fill in these boxes even if you plan on attaching an actual resume with this form. Include any other relevant information in Box 17. Sign and date the form before sending. A DA 3433 fillable form is available for download on the United States Army Publishing Directorate website or down below. You can file it digitally or print, sign and attach a physical copy of the form to your resume. The 'Skills' block will require you to list all of the knowledge, skills, and abilities you believe can help you qualify for the position you are applying for. Stick to what's important - do not write everything you can, just like you would in an actual resume. The skills are worth filing even if you are planning to attach a resume to your application - it's better to not leave any fields on the form blank. The Non-appropriated Fund (NAF) employment packet consists of three forms: DA Form 3433, DA 3433-1 and DA 3433-2. DA Form 3433-1, Supplemental Employment Application Form is completed by the applicant selected for NAF employment. 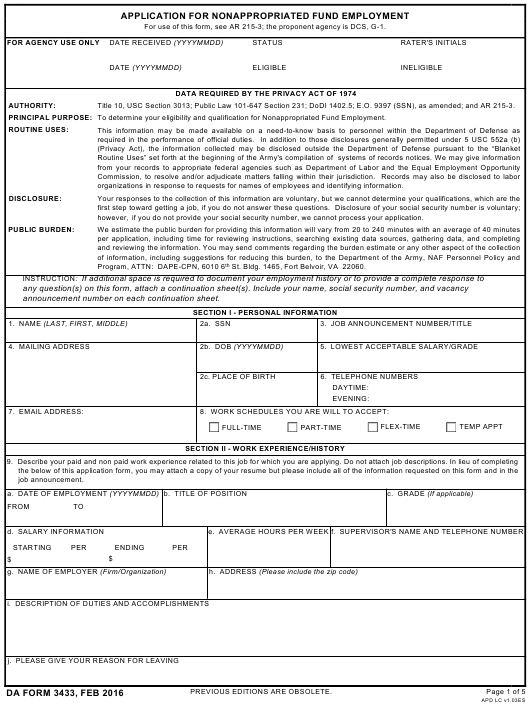 DA Form 3433-2, Supplemental-A Employment Application Form for Child-Youth Services Positions is filed by all applicants selected for positions that involve working with children or youth.